Linda Rocker writes with an almost ever-present sense of melancholy, never turning away from recognizing life is often troubled and unfair, especially as lived by women. Although there’s no overarching theme in Clean Margins and Other Stories, Linda Rocker is a nuanced storyteller who writes movingly from a female perspective, especially through the voices of women whose dreams are but shadows. In this work, women of a certain age mull difficult histories in nine short stories. 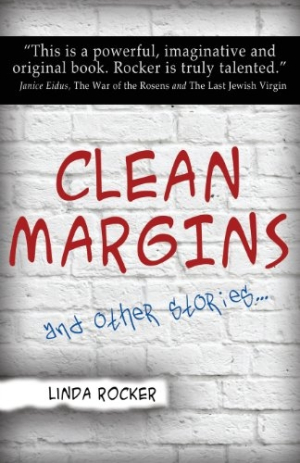 In the title story, “Clean Margins,” Rocker shows an ability to create atmosphere. The tale begins strikingly with a melancholy Edward Hopper-like image, spiraling down to a somewhat sad and bitter, yet resigned, conclusion. Here, as elsewhere, Rocker’s characters move with a measure of existential courage, even though they appear on the page as often confused. Although she occasionally stumbles, Rocker writes clearly and concisely, using everyday language to explore emotional territory through images and reflections rather than literary fireworks. Rocker has a psychological appreciation of why a woman might move about in an aura of emotional tenseness. In one uncomfortable scene, a woman confronts a sloppy older woman in a public bathroom. The self-absorbed protagonist thinks she’s only being “fair and not judgmental,” or so she tells her psychiatrist. Most of the stories seem set in the present day, but “Maternity” is written as a multigenerational, fictionalized memoir, delving into secrets and suppressed history as well as their effect on the author. The story is moving, albeit confusing in areas where who lived with whom isn’t clear. Rocker writes with an almost ever-present sense of melancholy, never turning away from recognizing that life is often troubled and unfair, especially as lived by women. Her use of language is straightforward rather than complex, and she’s a capable writer, sometimes offering layered, allusive pieces, suggesting a deeper drama lurking behind simple conversations between a man and woman. Rocker proves to be a gifted, insightful author of short fiction, one who writes of tragedy and suppressed desire from the feminine perspective.